Infini Media is a professional graphic design company that offers the best graphic design and printing services in Phuket at reasonable rates. 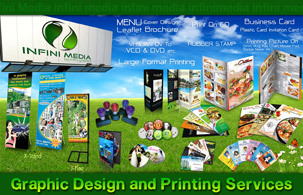 Infini Media, the Phuket’s specialist in graphic design and printing offers you a wide selection of services such as printing, business card, brochure, menu, plastic card, rubber stamp, sticker cutting, converting VDO to VCD & DVD, print on CD/DVD, large format printing for both indoor and outdoor as well as printing on various materials like pins, shirts, name tags, glass, mouse pads and key chains etc. With our high standard printing equipment and express service, you can ensure that you will save time and money including obtain the highest quality products. We will communicate to prospective customers what makes your company unique and different from others. Use our services to improve and create your image as well as acquire an edge over your competition. Your good image is our responsibility.